On 12 May 1927, British police raided the headquarters of the Soviet trade delegation and ARCOS (the All Russian Co-operative Society) in London, searching for top secret documents that were alleged to have been stolen from the War Office. The raid was a breach of the 1921 trade agreement with Russia, which had given diplomatic immunity to official trade agents of the USSR. Diplomatic relations between the two governments had become increasingly fraught following the election of Stanley Baldwin's Conservative government in 1924 (and the dispute over the 'Zinoviev Letter'). The ARCOS raid, and resulting fall-out, was the final straw - diplomatic relations were broken off and fears of war between the two countries increased. Memorandum on the crisis in Anglo-Soviet relations, 1925. Copy of a private memorandum by Christian Rakovsky, Soviet ambassador to Britain, on causes of increasing diplomatic tension between the two countries. Note from His Majesty's government to the government of the Union of Soviet Socialist Republics respecting the relations existing between the two governments and note in reply, February 1927. Diplomatic correspondence about the "notoriously... unsatisfactory nature" of Anglo-Russian relations, published three months before the ARCOS raid. Anglo-Soviet Trade 1920-1927: its extent and prospects of development before the severance of relations between Great Britain and the USSR. Special report published by Trade and Engineering Review in 1927, aimed at British businessmen, and intended to "assist the reader to form an opinion on the magnitude of the loss to both countries as a result of the recent events". Statement by A.P. Rosengoltz, Chargé d'Affaires of the USSR in Britain, regarding the Arcos raid, 1927. It denies the charges of espionage and condemns the "sensational" and "general cinematographic nature of the raid". Telegram of protest from Mikhail Tomsky and Alexander Dogadov of the All-Russian Central Council of Trade Unions, 14 May 1927. They condemn the raids at ARCOS and by Chinese police at the Soviet Embassy in Peking as confirmation that imperialists, headed by Britain, are planning a military assault on the Soviet Union. Raid on Arcos Ltd. and the Trade Delegation of the USSR: Facts and Documents, May 1927. Pamphlet published by the (pro-Soviet) Anglo-Russian Parliamentary Committee. It reproduces documents issued by representatives of ARCOS and the Soviet authorities, and includes personal statements made by Russians who had been involved in the raid. Documents illustrating the hostile activities of the Soviet Government and Third International against Great Britain, 1927. Official British government publication. It includes copies of documents found by the police during the ARCOS raid and Soviet telegrams intercepted by the Foreign Office. The publication of the telegrams proved counter-productive - the Soviets changed their method of encryption to one that British security services could no longer break. British Trade and the Arcos Raid, May 1927. Pamphlet published by the Labour Research Department (a socialist organisation not directly connected with the Labour Party). It condemns the raid and attempts to outline the losses to British trade that would result from the break. Stand by Workers' Russia! The truth about the break, May 1927. Pamphlet published by the Communist Party of Great Britain. It condemns the "burglary" at ARCOS and describes the diplomatic break as "practically... a declaration of war". Letter from Harry Pollitt, on behalf of the National Minority Movement, condemning the raid, 19 May 1927. The letter was sent to the Trades Union Congress, and calls for the TUC to take action. Copy of letter of protest sent to the Prime Minister Stanley Baldwin by Walter Citrine, General Secretary of the Trades Union Congress, 13 May 1927. The Russian trade agreement terminated by the Government, editorial from the National Union of Manufacturers' Journal, June 1927. Britain and the Soviet: Viscount Grey on the rupture, 29 June 1927. Report from The Times of a speech made by the Liberal politician and former Foreign Secretary. Relations with Russia, 9 June 1927. Memorandum by the Trades Union Congress General Council, protesting against the break in diplomatic relations and "attendant menace to the world's peace". Red Star, no.1, July 1927. Communist newspaper with the headline 'Tories plotting war against Soviet Republic". It includes references to the ARCOS raid and the trade losses resulting from the break. The rupture with Russia: Immediate consequences and ultimate dangers, July 1927. Pamphlet published by the Anglo-Russian Parliamentary Committee. It refutes charges made against the Soviet Union by the British government and outlines losses to British trade as a result of the "diplomatic rupture". Examples of trades council and union resolutions, protesting against the break in diplomatic relations, 1927. The Expelled R.O.P. Officials: Home Office statement, 27 August 1927. Manchester Guardian report on the Home Secretary's statement on Anglo-Russian trade, following the expulsion of two directors of the company Russian Oil Products (ROP). It also includes a reference to vandalism to ROP petrol pumps in Plymouth. Russia after ten years: report of the American Trade Union Delegation to the Soviet Union, 1927. The report includes a section on relations with other countries, including references to Soviet fears of war caused, in part, by the ARCOS raid. Russian banks and Communist funds, 1928. In 1928, British police investigated two more Soviet economic organisations in London which had been accused of "attempts to foment and organise revolutionary actions" - the Bank for Russian Trade Ltd. and the Moscow Narodny Bank Ltd. This British government report provides detailed information about the inquiry. Hands off Soviet Russia: report of the Cologne Conference of Friends of Soviet Russia, May 1928. 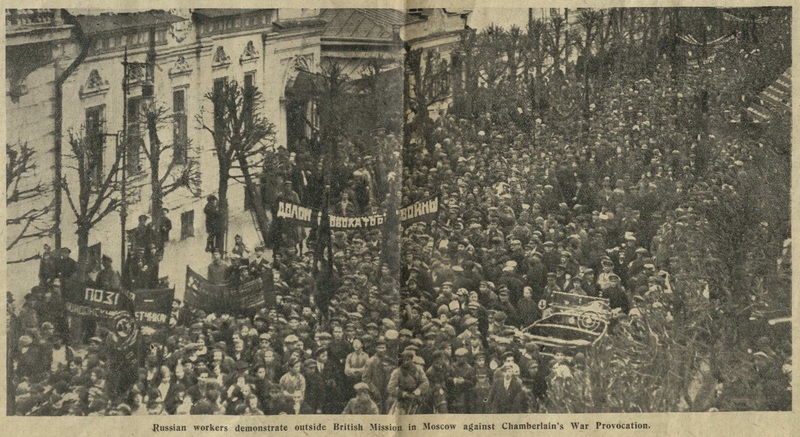 The conference called for the resumption of full diplomatic and trading relations with Soviet Russia, determined resistance by the organised British Workers to any attack on Soviet Russia, closest possible relations between British and Russian workers, and the development of co-operative trade between Britain and Soviet Russia.